Supermodel Forum • View topic - Sega Rally 2 in-game calibration? Sega Rally 2 in-game calibration? Where is it? 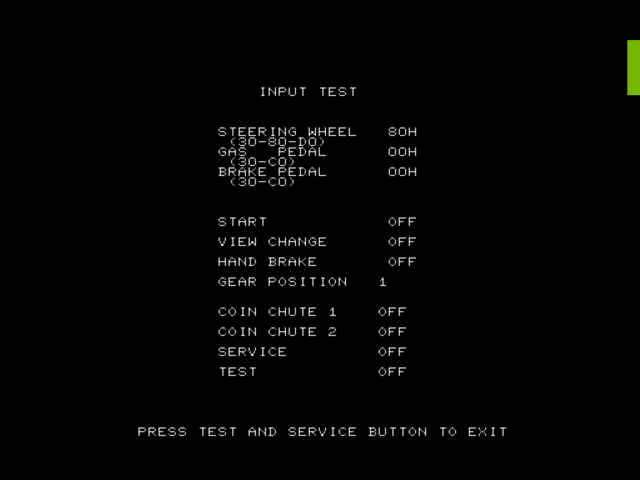 Steering, gas and brake don't range from 00 to FF by default and there's no option to change that in the test menu. Re: Sega Rally 2 in-game calibration? I just tried the Input Test in Sega Rally 2 and it seems to work fine. Steering ranges from 0-FF and is centered at 87. What are you seeing? It's likely to be your game pad or steering wheel, and the results should be the same for other racing games (or very close). Bart wrote: I just tried the Input Test in Sega Rally 2 and it seems to work fine. Steering ranges from 0-FF and is centered at 87. What are you seeing? It's likely to be your game pad or steering wheel, and the results should be the same for other racing games (or very close). I get this instead. The issue is not with the current values, which range from 00-FF as they should, but what the game thinks are the extremes. Look underneath the labels - gas and brake are only recognized from 30-C0 while the steering only goes from 30-D0, resulting in choppier, more sensitive controls. In other games there would be a Volume Adjustment option to fix that, but Sega Rally 2 lacks one. Worth noting this is Supermodel r741 x64. I've never noticed this before. As far as I know there isn't a way to calibrate this. Perhaps this should be an input setting in Supermodel?